Spot gold fell more than one percent to its lowest in a week on Wednesday, as the dollar strengthened following hawkish comments by Federal Reserve officials about the U.S. interest rate path. Gold had risen 1.2 percent in the previous session, when investors sought “safe haven” assets after deadly bomb attacks on Brussels, before giving up its gains. Spot gold slipped 1.4 percent to the lowest since March 16 at $1,231.01 an ounce in earlier trade and was down 1.2 percent at $1,233.26 by 1130 GMT. Prices fell as investors book profits ahead of the Easter break, which starts on Friday. 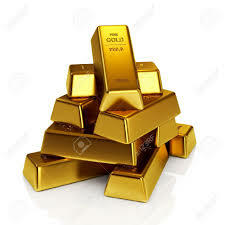 U.S. gold futures fell 1.2 percent to $1233.40 an ounce. Hawkish comments from U.S. Federal Reserve officials underpinned the dollar, which was up 0.2 percent against a basket of currencies. Philadelphia Fed President Patrick Harker said the central bank should consider another hike as early as next month if the U.S. economy continues to improve, while Chicago Fed President Charles Evans also said he expects two more rate increases this year. “The Fed (officials) comments put a bit of pressure on the gold price but are unlikely to derail a more positive long-term sentiment towards the metal,” ABN Amro Georgette Boele said. Higher interest rates increase holding costs of gold, which is a non-interest bearing asset. Bullion has rallied 16 percent this year, regaining its role as a shelter for risk-averse investors, in the face of tumbling equities and fears of a global economic slowdown. Venezuela exported about 443 million Swiss francs ($456 million) worth of gold to Switzerland in February, data showed on Tuesday, as the South American country’s central bank carried out swaps to receive cash due to a biting economic crisis. Switzerland became a net importer of platinum once again in February, data from the Swiss customs bureau showed on Tuesday, as shipments from major producer South Africa ticked up. Silver fell 1.3 percent to $15.66 an ounce, platinum dropped 0.5 percent to $983.30 an ounce and palladium dipped 1.5 percent to $593.97 an ounce.